Step 1: What is the maximum number of workers present at any one time? Step 2: What kind of work is being carried out? Does it place your workers at high risk to require immediate first aid treatment? Step 3: Is the workplace remote, or access to emergency services difficult? High risk workplaces with difficult access need at least one First Aider per 10 workers. Step 4: How is work carried out: alone, in transit, or without supervision? If having a First Aider available at all times is impractical, workers must be able to access First Aid assistance, through an effective means of contacting emergency services, getting appropriate information, instruction and training. Step 5: Finally, what other factors affect the number of First Aiders needed? For example: multiple shifts or overtime; seasonal work; large numbers of people present (schools, shopping centres); unique hazards (fitness centres, amusement parks); holidays and annual leave. There is no denying that the Work Health and Safety (WHS) Act has many facets, all of which need to be adhered to if a business is to comply with the new regulations. The problem is keeping up with the finer details. To help businesses in this matter, a code of practice has been drawn up by Safe Work Australia. First Aid in the Workplace: Code of Practice sets out clearly everything businesses owners and PCBUs need to know, effectively removing any confusion there may be. It provides information on a risk management approach ensuring the specific system is tailored to the specific risks and hazards in their workplace. There are also details provided on kit maintenance, additional equipment required, and the First Aid facilities expected. In addition to First Aid Kits, you should consider whether any other first aid equipment is necessary, like Automatic Defibrillators or Eye Wash and Shower Equipment. Providing an Automatic Defibrillator can reduce the risk of fatality from cardiac arrest and is a useful addition for workplaces where there is a risk of electrocution, or where there are large numbers of members of the public. Automatic defibrillators are designed to be used by trained or untrained persons. They should be located in an area that is clearly visible, accessible and not exposed to extreme temperatures. They should be clearly signed and maintained according to the manufacturer’s specifications. A portable plastic or rubber shower hose that is designed to be easily attached to a tap spout – for small, relatively low risk workplaces where a fixed deluge facility would not be reasonably practicable but the risk of serious burns is still foreseeable (a fish and chip shop). Facilities must be sufficient to cope with whatever demands might be placed on the first aiders in the event of a major accident – however unlikely that may seem to be. A risk assessment will help determine the type of First Aid facilities needed. For example, a clean, quiet area within the workplace that affords privacy to an injured or ill person may be suitable and practicable for some workplaces. Access to a telephone for contacting emergency services or an emergency call system should be provided as part of all First Aid facilities. A First Aid room should be established where there is a higher risk of serious injury or illness occurring that would not only require immediate first aid, but also further treatment by an emergency service. First Aid rooms should suit the hazards specific to the workplace, and should allow easy access and movement of injured people supported or moved by stretcher or wheelchair. Maintaining a first aid room should be allocated to a trained occupational First Aider, except where this room is part of a health centre or hospital. Health centres staffed by a registered health practitioner (a doctor or nurse) or paramedic can provide emergency medical treatment and cater to the types of hazards in high risk workplaces. Are You Compliant? We’ll Audit Your Business to Make Sure You Are! Alsco’s 2012 First Aid Compliance Guide conforms to the health and safety laws now applied across Australia, and gives you the best guidance in complying to them. Of course, many of the basic principles of ensuring safety in the workplace have not changed. So, if your business was compliant with the previous regulations as they relate to the provision of First Aid kits, there are few changes that you need to make. 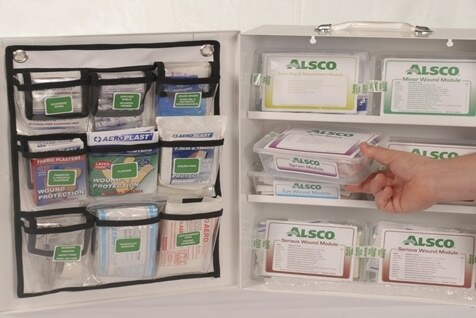 Certainly, we at Alsco are more than happy to help you meet the new First Aid kit requirements. If you’re not completely sure whether your company complies fully with the current WHS guidelines for providing First Aid kits in your workplace? Give our friendly team a call on 1300 077 391 for a free, no-obligation First Aid Audit. Many businesses like to buy their First Aid equipment, including their kits, but with WHS Act stipulating a need to properly manage and maintain First Aid Kits, the sensible option is clearly to hire professionals to maintain equipment and supplies. Alsco’s fully managed First Aid rental program means everything is taken care of, leaving you with nothing to worry about. You can be confident the First Aid supplies you need will be there every time they are needed. Agreed maintenance schedule by our friendly, professional team with a proven service record. Use our experience and expertise as a reference point to support you. Sturdy, highly visible, wall-mounted cabinets for immediate identification and ease of access – for first aid kits, AEDs and eyewash stations. Each item in Alsco’s First Aid Kits are colour coded for specific injuries, ensuring you select the correct first aid kit for your required situation. Well labelled, transparent packaging allows you to find the right supplies when you’re in a hurry. Each kit has a logical, standard layout that makes it simple and easy to use. Seriously, call Alsco right now! Act quickly and prioritise safety.